At Stansfield View, Todmorden, Yorks. 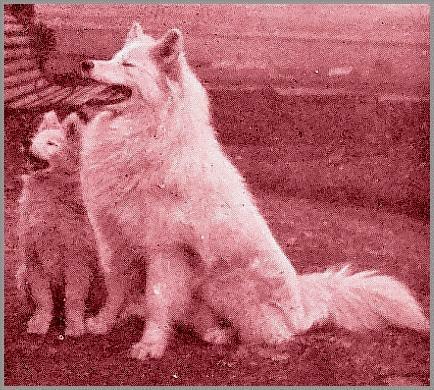 IN the offices of the American Kennel Club there hangs the photograph of a Samoyed, which is illustrative of the ideal of that white-coated race. It is the photograph of CH. 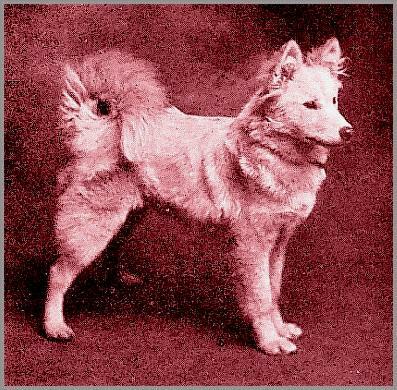 DONERNA'S BARIN, a dog which has not only put up the biggest record of his breed in the States, but one whose successes there have had a big share in inaugurating the great Samoyed boom that is one of the most notable features of American dogdom just now. Donerna's Barin was exported by Mrs. Pitchford, and when Mr. Seeley, his American owner, received the dog, his cable to Todmorden was not simply an announcement of safe arrival, but of his own amazement at his purchase's excellence, and an emphatic compliment to Mrs. Pitchford's methods of doing business. Only the other day, in a letter to me, Mr. Seeley referred to the Yorkshire devotee as "that sterling lady and finest fancier." Tributes like that are not so numerous in any walk of life that I need offer any excuse for bringing them out from below the bushel. Anyhow, in the foregoing you have an idea of Mrs. Pitchford herself and of the stock she sells. And now to some of the stock she owns. OSTEN, born in May, 1920, is by the well-known Kieff ex Ivanofna, and through his parents he descends direct from Ch. Viking, Princess Feodorovna, Draga, Houdin, Snow Cloud, Nastja, South Pole, Oussa, Nansen, Mezenit, Antarctic Buck, Kviklene, Ch. Pearline, Karen, Rostoff, Southern Cross, and Ch. Kirchie every one of them outstanding episodes in Samoyed progress. " I detest Samoyeds that look like Poms. which have grown too big," Mrs. Pitchford said to me, and Osten is a typical example of her insistence on real sledge-dog qualities. Strong-framed, with big feet and immense bone, hindquarters which denote both speed and power, a broad back, lovely head, eyes, and ears, and a snow-white coat, Osten is the sort that pulls his full weight both in the sledge and in the ring. A six-months baby, but a huge one for her age, and another example of that merit which ensnares everyone with Samoyed ideals, is NARYMA BELLE, by Siberian Keeno (the champion dog at the late Crystal Palace Show) ex Ice Flow, by Joanoff and Antarctic Zaza. Here again is breeding made manifest; even though Belle is still very much in the flapper stage, one can foresee the blossom in the bud. Or, once more, there is a hefty infant by Ch. Zahra ex Isilma. Bred as she is, this baby could hardly help being strikingly sturdy with enormous bone and that indefinable beauty of type in every feature and movement which is the final syllable in the classic animal. But looking at any of the Todmorden Samoyeds, one understands why Mrs. Pitchford could afford to let the American champion leave her kennel. " You never miss the water while the well keeps full," if I may paraphrase a proverb, and this Yorkshire stud ia a full well indeed.